AT&T Inc. announced today plans to exit the shrinking pay phone business by the end of 2008. Ma Bell’s ties to the pay phone stretch back to the very beginning. Bloomberg News recalls that AT&T’s predecessors were responsible for both the first pay phone in 1878 and then an improvement 11 years later. The first was paid via a clerk; the second took coins. But was it the right time for everyone else? Do you realize how difficult it has become to locate a pay phone? Do you know that it costs 50 cents now to make a call on a pay phone? Furthermore, do you know how difficult it is to find someone at Valley Fair who will give you change for a dollar to use the pay phone? Inconvenience may make our blood boil, but it’s inspiration that stirs the heart and demands that fans pay respects before pay phones are relegated to pop culture history. 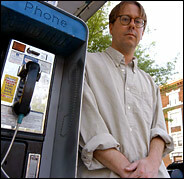 No one seems to have more pay-phone passion than Mark Thomas, the proprietor of payphone-project.com, a site that has been bearing witness to the decline by compiling links to news stories on today’s theme. “Who knew AT&T was still *in* the payphone business?” he said of AT&T’s announcement. Feel free to offer your own eulogy in the comment area below. Where will I be able to change? This story reminded me of a period in the ’60s when my mother decided to reduce her long-distance phone bills by installing a pay phone in our house. I guess it worked, but it was more than a little embarrassing when friends came over and wanted to use the phone. Seriously, is anyone surprised that AT&T would do this now that they’re in the cell phone business? Couple of weeks ago I was running late for appointment and worse again my cell battery ahd pinged its last warning and there I was stuck without a lifeline. I did run across several payphone - not one of them worked. So what happens to the millions of visitors to this city of ours? If they don’t have a working cell phone or if they’re out of battery time too? What happens if they need police or emergency services and there’s no police around - and let’s face it - its a fact of life - when you need the police there isn’t one near you! For all the years of forced devout service to Verizon and AT&T they should continue to maintain payphones - its not fair to those who don’t have them, can’t afford them or are from out of USA visiting - it’s not fair to the city. Note there is mention of civic responsibility, the public good, or of any benefit to society. How appropriate that this item is in the news on the same day Walter O’Malley, he who infamously took Brooklyn’s team to Los Angeles, is voted into the Baseball Hall of Fame. I guess greed is its own reward. One of the first devices that allowed us to feed it our coins, its many offspring do the same in much more efficient fashion. My own phone is pay-as-you-go. So my communications are limited to the bathroom. I mourn the loss, in particular, of your booth. The phone booth too, passes with you. Ask not, booth, for whom the bell tolls. — Posted by Can you hear me now? i feel for the people who manufacture and service these phones but, honestly, are there really that many people devastated by the loss of the payphone? the phone booths affectionately referred to by mr. thomas as “windows onto the human condition” more often serve as windows onto the condition of the grafitti artist; homeless shelters; and places where people conduct various businesses of types not often referred to in the business section of the ny times. i can recall an incident as a teenager when a friend of mine and i were literally chased down broadway by a man who thought we had usurped the drug business from “his” payphone while he was in jail merely because we picked it up to make a phone call in the days before cell phones. oh, how i shall miss those times. can you tell i do not feel any great sense of loss here? how about planting a new tree where each of these booths stood? a flower bed? a bench? something to beautify the area. in an age where almost everyone has a phone in their pocket, the time has come for the payphone to go the way of all things. Pay phones, like hitching posts, are a charming anachronism. The demise of the landline is next as wireless service supplants the need for copper wires. One place where I hope payphones remain is airports. A number of times, I have had a delayed or canceled flight and a low cell phone battery with my charger and a stowed bag. Be able to use a pay phone to make one or many phone calls has been a huge help the number of times (in fact, I have kept adding and using minutes on a pre-paid phone card for just this purpose for over 10 years, despite the fact that I got a cell phone seven years ago). I will miss payphones, and although I love my cell phone, I still think the idea that everyone must have one is poor (and with these rate plans, continues to make many of us poor). WWSD (What would Superman Do)? Payphones are also quite useful for people visiting the United States from other countries. Even if they have cellphones, they may not want to pay the combination of international roaming and long distance to make a local call (assuming their cellphone even works here). I use payphones quite a bit when I’m visiting other countries. Then again, this is pretty minor compared to the other ways we make it hard for foreigners to visit the US. Ah, memories from high school, circa 1960. In western Canada, payphones had no numbers. You could not call to a pay phone. One classmate somehow got the code allowing one to call payphones (an early hacker?). So, for months, this knowledge and our new access to parents’ cars (belated apologies, Mum and Dad; it is I who burnt out the clutch in my one mini-drag race) led to our game of kind of payphone orienteering. A call would be placed to a payphone at a given location and time; I had to be there to answer it, to thef amazement of onlookers. Great, and not too harmful, fun. Good old Calgary, Alberta, Queen Elizabeth High! More social stratification. Those that have would probably claim pay phones are only used by drug dealers and hookers. More pushing people that are below a certain level, down even further. Seeing a trend here yet? Poor people are just war machine fodder, dragging down the system of the powerful rich. Imagine travelling in an automobile on a lonely stretch of highway and no CELL phone; I think public telephones should be maintained for those unable to afford those pay-as-you-go-cellphones, whose fees are a classic example of end-user gouging, classic example of telephone-usury by all the communication entities. Good riddance. Payphones have become useful only for drug dealers nowdays. I hesitate to even use one thinking about all the people who handle them day after day, slobbering and coughing on them all day. I’m surprised more people haven’t caught Hep C or worse from them. People will simply die for want of access to a pay phone. I won’t go back to ATT for any kind of service because of this. On the same mental track, we might as well end all public transportation and rely solely on the automobile. — Posted by Arnie K.
For people who need a low usage “emergency phone”, T-Mobile Prepaid is a super cheap choice. In my area, coverage and signal strength are excellent. Almost 40 years ago, my mother’s college roommate found a slip of paper in a pay phone booth with my father’s first name and number, and she dared my mom to call. That led to a series of crank calls, which led to the meeting of two adventurous kids in the dead of a Boston winter to make a snowman together…and not too long after, to make ME. I owe my life to the pay phone. I’m sad to see it die. How many other family stories begin with a pay phone call? Pay phones? Good riddance. These eyesores are particularly unwelcome in New York City, where we tolerate grafitti and general vandalism. AT&T is not responsible for the public good or civic responsibility. As much as I like pay phones too, AT&T is a corporation. It was nice of them to mention employees and customers in the press release. Really, the main objective is to be profitable, that is their responsibility to stockholders. Payphones probably arent very profitable these days, so I cant blame them for wanting out. Cell phones are pay phones. Last time I checked, they were not free. I was an immigrant to Ottawa Canada in 1988. I had a work visa for a ballet company. I couldn’t pay my rent and phone. So the burden of communication fell on my family’s shoulders. They paid for every collect call I made during the winter. I would put on all my layers of clothes and hide low in the phonebooth two blocks away through a church parking lot. How many hours did I spend there? My family never mentioned what was spent. Last year I went back to the same booth to call my family. I was again performing in Ottawa. I wanted to call and say thank you for everything they gave me–surporting my leaving, helping me in everything since. But there was a young woman already there. She wasn’t dressed very warmly for the middle of winter. She had ear muffs and white sweat pants. After awhile I knocked on the doors of the booth. She was speaking in Japanese. She said goodbye to her mom. And let me into the booth. Payphones are terrific emergency lines to have. Most town landings on outer Cape Cod have them. If one’s cell has no reception (Very common out here), and there’s a (marine) emergency, the pay phones come in quite handily. And aren’t we NOT supposed to use cell phones to place 911 calls anyway? Visitors to tourist areas may find emergency services more difficult to procure. Wow. What a lack of civic responsibility. Shame on Ma Bell. I’m still on a pay-as-you-go cell — and it certainly doesn’t work outside the US. I’m constantly using payphones abroad, and in airports here, as I tend to leave my cell at home. (I’m hoping that Deutsche Telecom won’t be dismantling it’s groovy payphones with pink handsets in the near future!) I pity all our new foreign guests, anxious to spend weak dollars…no way to phone home from the mall anymore. Emergency phones should be the purview of local governments, if that is the pressing need. Before we bemoan their loss we ought to ask emergency services how many legitimate emergency calls they get from pay phones nowadays? And furthermore, the last person I saw use a pay phone at an airport was a young child who was amusing himself while his mother was distracted. For those of you who view every development through the “2 Americas” heuristic, raise some money and maintain pay phones. Why should someone else have to run them at a loss? Raise some VC money and fund Nostalgia, Inc. Perhaps you can produce some relic cars, too. A few years ago, a new type of cell phone was announced - it was even named an “invention of the year” by one of the news magazines, and I think it was covered in the NY Times. It was a stripped down phone that didn’t require any monthly fees, and you would only pay for the minutes you used (after you bought the phone, which was fairly cheap because it didn’t have any fancy features). You could keep one in your glove box or backpack, and only pay when you needed to use it. (Even “pay as you go” phones require you to keep paying every few months if you want service, but this phone did not.) I kept looking for this phone, because it was perfect for me, but it never made it to the market. I had their web site bookmarked for a long time, but I think it finally disappeared. The cynical side of my brain wonders if the cell phone companies kept it off the market because it would cut into their business. “Nobody” (#19) has a point. I happen to think we need pay phones. Cell networks go haywire in emergencies (I relied on pay phones to keep in touch with my wife on 9-11), and cewll phones aren’t always in range of a signal and can run out of juice. If providers lose money on pay phones, they should be subsidized with tax money as a necessary public service. I believe there is still a future for payphones. They could be offered by Skype, or Google. They could be simpler, come in different colours and use the Internet to handle the calls. So they could be cheaper, and still make money for the stockholders, as they could be used for long distance/transatlantic calls. They could be used to display ads. They would accept a wide array of cards. They could connect your laptop where the is no wireless. All solid state, no mechanical parts worth of mentioning, or maintaining. So much life left in them!! Ten or so years ago I went up to the top of the Empire State Building with my Hungarian boyfriend. We’d both just moved to the city from Budapest and he loved going to the top of buildings more than anything. While we were up there he noticed that there was a pay phone next to the gift shop that listed an incoming number so he jotted it down. For weeks afterwards we would call the number just for fun and wait for someone to answer the phone. Almost always someone would answer and Peter would ask them all sorts of questions about where they were from and why they were visiting the Empire State Building. It was fun, hilarious and many times very touching. I’ll miss the demise of the pay phone prank, not to mention the occasional bonus quarter. Phones are ubiquitous - who needs eyesores that generally do not work? As a ‘mobile’ New Yorker and global citizen, I do not have a land line. As a full time graduate student, I do not have a lot of money. When my cell was shut off for non payment, I went to use the pay phone at the end of my street to call the cell carrier. I was surprised to find the pay phone gone. Luckily, Ms Kim at the Korean deli next door let me use the deli phone. On hold with the cell carrier, I kept thinking about September 11, when cell lines were jammed and I waited in line for an hour to phone my family in the Midwest to let them know I was safe. What would have happened that terrible day if there were no pay phones on the streets of Manhattan for millions of people experiencing the disaster to use to call home? Removing the phones means removing a lifeline, and not just in times of disaster and distress. It struck me this weekend, as I noticed a man on the corner in my neighborhood at the pay phone, with a phone pressed to his ear. It occurred to me that it had been literally YEARS since I had seen someone using a pay phone, with the exception of old movies and the airport. Then, as I looked closer, I noticed that the phone he had pressed to his ear was a cell phone — he was just using the small shelter of the booth to keep out of the rain. Touche. Pay phones are harder and harder to find in Manhattan. I guess it takes a rocket scientist to figure out that they’re not just for the down and out, they’re for every day people with emergencies across the board. I personally resent cell phones - cell phone culture is gross, frivolous and pollution. That being said - I truly doubt pay phones will ever go away - AT&T backing out of the game will just allow smaller companies opportunity. I am very pleased that AT&T is eliminating pay phones. Next, I would like it if AT&T eliminated health coverage, holiday pay, sick pay and all other forms of paid leave for their employees. They also need to reduce wages to below-sustenance level for all workers not considered upper management. Then we need a serious round of layoffs, followed by merger or two to boost stock prices. I am a shareholder, and I demand it! I deserve my stocks to keep climbing higher and higher, don’t I? AT&T simply owes this to me and my fellow shareholders. Gosh, this kind of stinks. We don’t use cellphones, and when we are out and about we depend on payphones. When I travel overseas, which is often, I have always used a payphone to call a hotel, cab, or family member, often with a pre-paid phone card. It made life much easier for tourists. I feel bad for those visiting the US. For the past 25 years I’ve been on call 30 days a year. Am expected to be at the hospital in 1/2 hour . Try finding a working pay phone in the Camden, NJ area and being at the hospital in a 1/2 hour . Never worked . There are very few and you can’t depend on those that are available. Have a cell phone for this purpose only. Good riddance. I remember when the average person was able to go to the market and buy a pound of lunch meat or a tube of toothpaste without first calling home and running it by a spouse. I get along just fine without a cell phone and intend to keep plopping a quarter into a pay phone the once or twice a month I need to make a phone call when I’m out and about. When the pay phones are gone the sun will still rise in the east. If telecommunications are vital to modern man, a pay phone is Plan B. But for those living in First Class, and those living in a Fool’s Paradise, there’s no need of a Plan B. Having lived through the telecommunication’s carnage of the first Katrina, and days without power, I avidly look forward to the next Katrina, for my US entertainment, whether from First Class, or Fool’s Paradise. Unhappily, the poor will be included. Good luck! Does anyone remember how on 9/11 everyone’s cell phones went out and we all had to rely on pay phones? I do. I was one of those people using a pay phone to let my family know I was still alive. Landlines will always be necessary and used in an emergency, but I guess the public good just isn’t turning a buck like it used to. Someone mentioned hacking earlier, and that is how I will always think of them. When I was a kid in the 80’s a friend knew how to make a pay phone call itself, creating a prank where a payphone would sit ringing until someone picked it up, when it would hang up. Another friend in high school found a test tone that represented a nickel. When recorded onto the short-lived Hallmark audio greeting card, it could be played back into the mouthpiece to provide credit on long-distance calls. So with this greeting card that made the funny sound you could call anywhere in the world for free. I’m sure people throughout the decades have a lot of stories about hacking payphones. That’s how I will always remember them, assuming someday they’re gone. If you REALLY need to use a phone, just ask to use someone else’s cell phone :) Most people would probably be willing to help - or might accept money to do so. Here in NYC, there is no shortage of pay-phones. They seem to serve as billboards first, and as payphones second. I’m guessing that they generate alot of advertising revenue for phone companies. When I worked as a salesman in New York, I would roam the city skyscrapers, looking for the coolest payphones in the most exotic art deco buildings; A welcome latterday “cone-of-silence” from the hubbub of city life; a place to get out of the rain; a place to make long distance calls that don’t lose signal. These were the class acts of the payphone world; a fond farewell from this afficionado. For what it’s worth, I called 911 today 3 times on my cell phone and they couldn’t hear me. So I found a pay phone to make the call. I faced the same situation as commenter #3 just last week. All the pay phones at Hunter College no longer work for some reason. All the phone booths are gone now, The only phone booths I have seen around are the ones I found hidden in the Brooklyn Public Library. We should keep pay phones in large public areas - airports, train/subway stations - so as to allow for people to make calls wherever cellular service isn’t available. As a health care advocate working with and for indigent New Yorkers, I can attest that many of my clients have no cell phones. More than a few of these clients call me from pay phones, urging me to hurry up my work and answer their questions quickly, as they have few quarters. Those who do have pre-paid phone plans frequently don’t have the money to put new minutes on. I hope AT&T knows that they will not gain subscribers to their more expensive products by cutting their more affordable ones. This is not a lucrative market. My clients can scarcely afford their $3 Medicaid prescription co-pays; they are not about go to buy an AT&T plan. I’m an old geezer, driving a twenty-year-old car, since I’m also a poor geezer — too poor to pay outrageous cell phone fees. What am I supposed to do when the car breaks down? Walk to AAA, I guess. I can still walk all day if I have to, but a lot of old folks can’t. Car breaks down, no pay phone, they’re in real trouble. And what about homeless people? Being homeless doesn’t mean you’re evil; it may just mean you had bad luck. How do you call for help when you’re having a heart attack? Even cops can and do help the down and out sometimes, but they’re in the public sector. AT&T, to the best of my knowledge, doesn’t help anyone who can’t pay. AT&T is a for-profit organization that’s not likely to worry about unprofitable social issues if it doesn’t have to. That’s a major reason we have government. Maybe the public sector can find a cheap way for the poor to make a phone call — even if they have to force cell phone service providers to provide that service to the poor as a cost of doing business in the U.S.
Afterthought: Any drug dealer worth his/her salt already has a cell phone. They haven’t monopolized pay phones in years. I use pay phones once a month or so — better the occasional fifty cents for a pay phone than fifty bucks a month (or whatever) for a cell phone. PEOPLE SEEM TO HAVE BECOME MORE IMPORTANT AS PAY PHONES DISAPPEAR! Three reasons why I hate the cell: (1) people, in the main, have not used the most basic of ettiquet; (2)it seems that when I walk in the street everyone is having a converstion — and when I hear the contents (which I really don’t want to but am forced to, it is composed worthless drivel; (3) since it has become a status symbol — but since (almost) everyone has a cell and consequently, everyone is now IMPORTANT! Of course, if everyone has a cell, the conundrum is: how can all owning this devise be important? The pay phone was usually used quickly for important calls. My father is in his 70s and doesn’t have (or want) a cell phone. Last year, he had car trouble, located a pay phone and called for help. What will happen now? He doesn’t drive much, only locally, but wihtout a pay phone ar the corner store, he is without resources. So we’re forced to pay $40/month for minimal service to provide public access? I also relate to the person who mentioned a dead cell battery - a pay phone is a welcome respite. Wireless companies should consider pay phones a public service. They make money hand over fist from the rest of us. What about people who can’t afford cell phones, and I include myself? I am retired and on a fixed income. I am forced to have a landline phone for Internet service. The world definitely still needs landline public phones, and so do you, even if you carry a cellphone all the time. Both direct experience and the coverage maps published by the major carriers will tell you that there are still plenty of places in the countryside where a cellphone probably won’t find a signal — almost anywhere off the interstate in the Catskill Mountains, for one nearby example — and even well-saturated big cities have lots of dead spots in them, including most basements, many parking garages and (for now at least) the New York City subway. If your battery’s exhausted, or you left the phone on your dresser, or you’ve dropped the phone in a slush puddle, or a local crisis means the circuits are overloaded, or somebody has set up a cellphone jammer where you are (illegal but not unheard of), you are equally out of luck without a coin phone. Just as important, your cellphone is constantly reporting its precise whereabouts and your calling traffic to a giant company that has shown no hesitation about revealing that data to the government, subpoena or no subpoena — and you can bet it won’t be long before we find out they are selling it to the Googles and DoubleClicks and Experians of the world too, not to mention your soon-to-be-ex-spouse’s divorce lawyer. So unless you are prepared to buy a prepaid cellphone with cash and then throw it away after one use like in the movies, about the only way you can hope to make a truly anonymous call when you need to — say, to blow the whistle on a crime — is by using a payphone, preferably one that is not in range of some surveillance camera. I actually use the pay phone in the lobby of my dorm quite a lot. My cheap, crappy Motorola cell phone buzzes all the time when I talk and nobody can ever hear me. So, when my roommate’s asleep and I can’t use the land line in my room I head downstairs to use the payphone. I am not the biggest fan of pay phones. They do take up space on our increasingly crowded sidewalks here in NYC (but will probably be replaced by more street vendors catering to too many obnoxious American tourists. And due primarily to cell phones pay phones will nevermore be utilized (assuming they are functioning) at a capacity to make them profitable for our telcos. But as nobody points out above, the primary consideration here is phone monopolies making profits and avoiding losses. Even at fifty cents a call pay phones are likely critical to the lives of enough people living at or below the poverty level. Will the local or state or federal government step up and offer free or cheap phone service for those of us not able to afford a cell phone? I hope so but tend to doubt it…. Ah, this brings back memories from the 1980’s, when I worked in management for AT&T and we had to step in for the operators during a strike. We were warned not to fall for the various scams people would pull with pay phones, such as making a collect call to a pay phone in another country — where someone would answer and “accept” the charges. (We learned how to identify those phones by their numbers). Another one involved person-to-person inter-national collect calls made from a pay phone. These calls were more expensive, but billing (accomplished by us collecting the coins) wasn’t supposed to begin until the desired person got on the phone at the other end. When someone answered, the caller would claim to be asking for that person, but would instead begin the actual conversation…in a language we didn’t speak, so we had no way of knowing what was going on. Of course the caller claimed that the “right” person wasn’t available, and that the call should be free. We soon caught on to this one also. The amount of ingenuity — and chutzpah — was amazing! Yes pay phones are probably beneficial for tourists/if your battery dies. But it is not the responsibility of AT&T to maintain those if they are losing money or capital can be better deployed elsewhere. If everyone is so concerned about keeping these rarely used phones operational, write to your legislative representative and ask them to raise YOUR taxes to fund it. If the system is going to be kept viable for “the public good,” then the public has to fund it, not AT&T. I forgot my cell phone a couple of weeks ago and needed to make an urgent call while out. I searched and finally found a pay phone. What if it hadn’t been there? I was miles from home. I would have been in a really desperate way had I not found the pay phone. What about people who don’t have cell phones. I think it’s an essential public service. Several readers have commented that people from other countries can call only at great expense in the US, IF they have a phone which is compatible with US systems. I work in numerous countries of the world and in each country, except Japan, I buy a local pre-paid number. I have a quadriband phone, the only kind of which can be used everywhere except Japan. The US is behind the rest of the world in not making pre-paid service widely available but it is catching up. I flew into Cleveland Hopkins International Airport a couple of weeks ago. Banks of pay phones once lined the concourses throughout the airport. Most have been removed. When I did finally come to one, it cost $1.50 to call my ride to say I’d arrived (luckily, I’d scooped up a handful of laundry quarters on my way out the door that morning). It seemed ridiculous to me — scant pay phones in an airport, of all places; and an outrageous buck-fifty for a 30 second phone call! I do not own a cell phone. I do not want to own I cell phone. And I resent finding myself in a situation that leaves me feeling it might be more convenient to have one, after all. The beauty of pay phones was that one always found them in useful places–airport terminals, bus stations, hotel and office lobbies–ready for the really necessary phone calls. What do we have to replace that reassuring sense of reliable readiness? We’re surrounded by cell-phone Babel–but can we reach our ride when we need to? It’s time techneology catches up with the payphone as the credit card has become your electronic wallet the phone should be line actuated by a credit card and the cost of the call shoud get debited to the card by a mere swipe in the phone slot.It could be also good PR marketing tool for co’s like American Express to extend this service as a card privilege. My teens are members of the minority that do not have cell phones and won’t until they can pay for them. Most teens only use their phones for texting anyway. Until then, they’ve been doing just fine with pay phones. Having a choice of buying prepaid minutes that expire or committing to a minimum of $240/year for two phones is no choice at all. Pay phones are more of a necessity than a cell phone. With a memorized calling card number tied to our land line, we don’t even need change. In many places you’d get five or more minutes in your own little phone room with a ventilating fan and a cozy light and warm wood seat and bifold doors with glass that shut out all of the chaos. it was a respite, an oasis. and often we’d wait in line for a booth, it was a communal experience. the problem now is that there’s nowhere to go to make a call, so we’re more exposed. we lost an important little shelter. I know this is always a shock - but the entire world is not made up of New Yorkers and people visiting New York. Here on the Oregon Coast the cell phone reception is notoriously bad - as is the job market. That means that some of us do the wise thing and do not spend hard earned money on a frequently useless item like a cell phone. But yes, I have needed to make a call while on the road - and even out here the pay phone are disappearing. And I do see it as a ‘class thing’. If you don’t have enough money to get a cell phone - your needs are less worthy. It’s time for local governments to step up to the plate. Pay phones are a necessary public service (where the cell signal is poor, for people who choose not to have cell phones, for people whose cell batteries have died, etc.) and should be provided like any other necessary public service. It’s important to make everyone use only cell phones so that callers can reach them any time of the day or night, 24/7/52, or know the reason why. Thanks for scrolling down to #65. In the ’70’s, there was this scrawled on or etched into every payphone in Manhattan: “Jesus saves … but Esposito scores on the rebound” - I still want to know who came up with that. lots of good reasons why pay phones should be mandated as a necessary public service outlined by these comments and I for one am saddened by the indifferance with which the need is being greeted by many who have commented. can’t afford it; no signal on your cell; poor reception even if there is a signal……….emergencies of many sorts. and unlikely graffiti or drug dealing will be eliminated by eliminating them. but as a useful tool in an emergency, PRICELESS! Emergency Services are completely left out of most conversations when it comes to pay phones. All most people want to talk about is how much it cost to use one. What they don’t see is the intrisic value of the emergency lifeline provided by pay phones, proven in 9-11. When most of the city’s phone service was down and the cell phones weren’t working, the pay phones continued to support the community and became a valuable asset to those in need during that emergency. They serve many purposes besides a phone for the poor. What most people don’t understand is the cost to run and maintain these phones. It’s very expensive to operate a payphone in today’s market. AT&T’s decision to get out of the business is proof of that. If they could make money doing it, they would continue to do it. The FCC needs to take a much harder look at subsidising the market to offer the lifelines and emergency services provided by these pay phone operators. The costs continue to escalate and the revenues continue to decline. As in any market, when that happens, it’s just a matter of time before it’s history. AS a nation of technology, we need to address this issue before there are no payphones left or the price of using one becomes out of reach for even the average citizen. I agree that pay phones are useful, etc. But have you noticed how they are often placed in crazy places? For example, places where they can’t be found, illogical places. Or, if in a big city, like NYC, they are ALWAYS placed in incredibly NOISY places, at busy intersections, where there is no way you can hear anything? For example, in NYC, they are placed at intersections of avenues and streets (the noisest places that exist), instead half a block up the side street, where you could actually use them. I think these were the ploys for the phone companies to make more money (keep trying different phones and wasting your money) or just shows their mind-boggling incompetence, or both. Nobody (#19), your blanket statement that corporations are “not responsible for the public good or civic responsibility” is quite startling. I’m not arguing, here, about pay phones, but about your larger point. Taken to its logical extreme, this means corporations should do whatever they can to preserve the bottom line, regardless of the societal consequences. If that were true, people wouldn’t be outraged when they learn, for example, that Nike uses third-world sweatshops, or that mountain-top removal coal mining is devastating to the environment and the Appalachian community. You certainly wouldn’t say that an individual citizen is only responsible for his bottom line, and not for the public good. Well, companies are corporate citizens. They have a lot of rights in this country, and with those rights come responsibilities. I use them, you jerks. You’re the people walking down the street staring at your little portable screens, bumping into me. I’m the one politely talking privately (usually to someone’s cell phone answering machine) on a pay phone. I don’t have a cell phone because I see them primarily as a force of separation and discontent, so this news, for me, is bad. I wonder what people will think about payphones not being around during the next NYC crisis (a la 9/11 and the blackout), when land lines are all that connect us to each other. They should be preserved for this reason alone; but they should also be preserved for those consumers who do not want to enter TWO YEAR contracts with money-hungry telecom companies. A small town in Washington State reminded us that there is a dead simple way to settle things once and for all. President Bush on the National Intelligence Estimate on Iran. On Dec. 5, 2001, an errant American bomb almost killed the man who would be president of Afghanistan. Mohamed ElBaradei finds himself in blissful agreement with the American intelligence community. Will he stay in power, using the next prime minister as a puppet? In the news business, the opening sentences of a story are referred to as its "lede" -- spelled that way, journalism lore has it, to avoid confusion with the lead typesetting that once dominated newspaper printing presses. Every sentence in a news story, though, has the potential to spiral off in new directions, and that's where The Lede's mission begins. Boing Boing "A directory of wonderful things"
City Room Our blog about New York City. Newsvine Updated by the People, for the People. Passport By Foreign Policy magazine.